Northern Jutland's eleven municipalities and Region have mapped the possibilities of becoming 100% self-sufficient with renewable energy by 2050. In cooperation with the North Denmark Region, the eleven municipalities have analyzed what it takes to become self-sufficient with renewable energy by the year 2050. The municipalities and the region are cooperating to avoid suboptimization and poor decision-making throughout this transition. Thus, the foundations are laid for a strategic energy plan with common goals which, with the green transition, can create 50,000 full time jobs. Sharing knowledge and experiences has been a major part of the project since the beginning. The work has been conducted through a number of established technical working groups focusing on wind turbines and district heating among other sources. Wind energy will contribute to making the region self-sufficient through renewable energy by 2050. Each of the groups has prepared a guidebook targeting other municipal employees, which brings together knowledge, experience and advice on the different topics covered. These guidebooks can also be accessed by employees from municipalities outside the North Denmark Region. The project has strengthened municipal cooperation toward energy sources and has come up with options to make Northern Jutland self-sufficient with renewable energy. 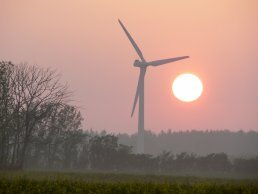 50,000 full-time jobs will be created as a result of the 12 billion EUR investment required for Northern Jutland to become self-sufficient and run on renewable energy. The North Denmark Region faces the challenge of local out-migration. Job creation has therefore been an integral part of the green transition plan, supporting local development and energy optimization. Collaboration between Brønderslev, Frederikshavn, Hjørring, Jammerbugt, Læsø, Mariagerfjord, Morsø, Rebild, Thisted, Vesthimmerland and Aalborg municipalities.